This interactive presentation contains the latest oil & gas production data from all 13,606 horizontal wells in the Permian (Texas & New Mexico) that started producing since 2009/2010, through November 2017. The above graph shows the remarkable growth in oil production from horizontal wells in this area, with the pace even increasing further in 2017. The small drop in November is likely caused by incomplete data, which is usual for these states, as I expect that another record was set again. If you change ‘product’ to ‘Gas’, you’ll see that the story for natural gas production is very similar, although the decline rates are somewhat lower. In the “Well quality” tab, the production profiles for all these wells are shown. Average well performance improved significantly from 2013 to 2016, and was again slightly better in 2017. Unlike some of the other basins, the improvements are not only located in the first 1-2 years that a well is producing. The ‘Top operators’ tab shows that the 3 largest operators each operate more than 100 thousand bo/d of gross production here: Pioneer Natural Resources, Concho and EOG. If you click on Pioneer Natural Resources in the legend, you can see in the map below that it only operates positions in Texas, while the other 2 operate in both states. This “Ultimate recovery” overview shows the average production rate for these wells, while they are heading towards their ultimate recovery. Wells are grouped by the quarter in which they started production (you can change this to year or month, using the ‘Show wells by’ selection). The performance of the wells that started in Q3 2017 are a little below that of wells starting in Q1 2017, as is shown by the blue (Q3) and orange (Q1) lines on top. However, the number of wells that started in Q3 was also far larger (147 vs 87). By tracking the red curve, you can see that the 97 wells that started in Q1 2016 peaked at a rate of about 640 bo/d, and are now just above 100 bo/d, with a cumulative production of over 150 kbo (all averages). Later this week I will have a post on the Eagle Ford, followed by one on all 10 covered US states. Reference is made to a 2014 Apache AAPG publication which presented the results of low, medium and high GOR Wolfcamp simulation studies for a 70′ thick, 6% porosity 1 microdarcy reservoir intersected by a 7,000 horizontal which was fraced basically 100 times. 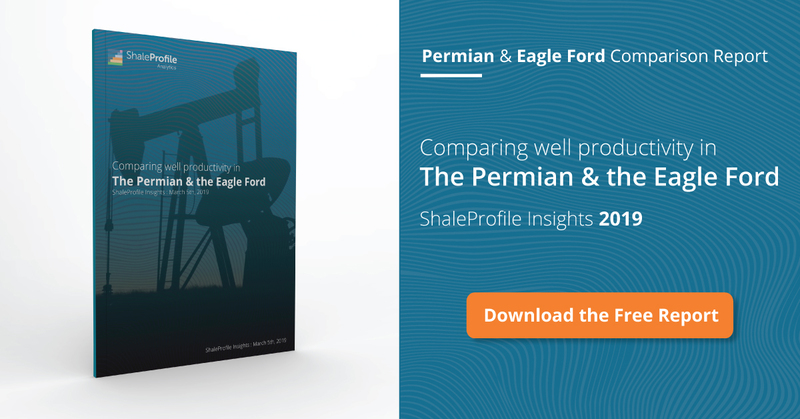 A comparison of the 1st and 2nd quarter 2016 average permian noncon well is overlain below with the results of the the medium GOR Apache case. Also shown are EOGs 2008 Bakken wells, which appear to be 600,000 barrel oil wells. If there is a reason to support an average Permian well ultimate oil recovery exceeding 250 MSTBO and thus bettering the Bakken, I haven’t seen it. thank you for sharing your update on this! Your welcome Enno. How is the “wells in lease production but not formally completed” problem this month? Looking at the data in my latest post on the Eagle Ford, it appears that the problem (production of certain new wells is reported, although these wells are not yet assigned to a lease or proration schedule, which causes incorrect allocation of the production data to older wells) has become worse, as you can see that the production in older wells is increasing. I didn’t have extra time this round, but before my next update I aim to create a metric which can capture this issue. It seems like several of the commentors on the site are quite skeptical re: the underlying unit economics of shale oil. Any helpful resources to see the analysis supporting this view? I don’t think it’s enough to point out that these companies are FCF negative. Of course they are when they are growing production this rapidly. Walmart was FCF negative until 1997 (>20 years), but it worked out pretty well because the underlying unit economics were compelling (I’m not comparing WMT to E&P, just citing that E&P FCF is negative is not sufficient by itself). I’ve heard these Rystad folks are pretty good, and in this Nov-17 presentation, they estimate Permian operators need a $53 oil price to deliver a 10% return inclusive of full-cycle costs. The breakdown of the $53 breakeven estimate is $42 for a 10% ROIC on the marginal well + $8 inclusive of infrastructure and G&A + $3 for land acquisition costs. 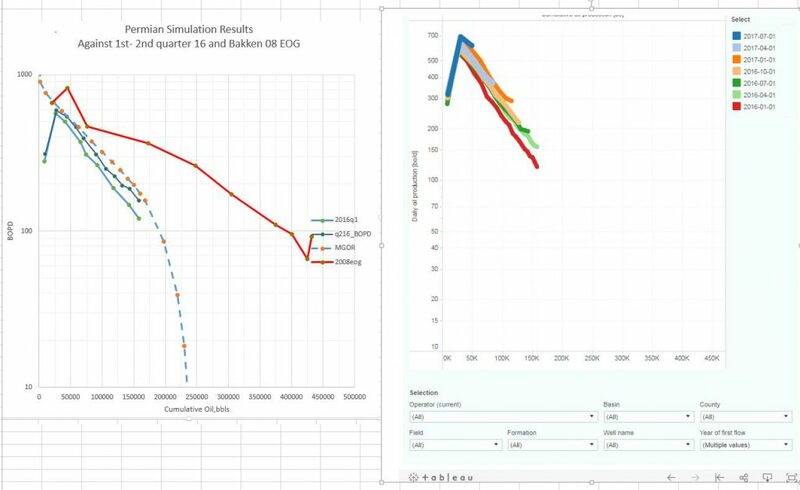 I think you’ll agree that few companies are touting a 250 MSTBO oil EUR in their powerpoint type curves, broken out into components it is always generally twice that. Yet here you can see with you own eyes and judge what proven average well performance is. Too early to tell would be the correct conclusion, though we have the benefit of being able to borrow from other older plays for our guesstimates. Would like to know what Rystad is using for an average oil recovery. That is a pretty presentation but one black and white slide with that number would be helpful. Any idiot with MS Excel can discount (1+i)^-n. This leaves 175mboe to pay the bills. If we assume 80 acres/well @ $30,000/acre land cost is $2.4MM, or $14/bo. Adding $8 for LOE/G&A/transportation etc, we now have $22/bo for land and LOE ($14+$8). Assuming an $8MM well cost this adds $46/bo. So assuming no other costs (maintenance capital, interest expense, G&G/seismic, lost sunk costs etc.) b/e is about $66/bo ($22 + $46). Probably pretty close but 250 MSTBO would be oil only so the gas could pay the LOE at 2-3 MCF per barrel and the discount cost might bring you to your $66 buck result. No doubt there are companies on the low side of this average and companies on the high. So we have a play that basically does what it is supposed to do- it sets the marginal cost of a barrel of oil. The workers and management get paid, the vig gets serviced, and the world gets cheap gasoline- wonderful. The key is there is nothing in it for the shareholders- over time they will start to realize this if these oil prices persist. How would we know any of this without http://www.shaleprofile.com? I did notice that Pioneer now has acknowledged and changed the SWD cost into drilling and completion capital of $2.6billion in their latest PPT. The extra $260 is for vertical integration water sourcing, gas processing and sands. So, the final cost of each well is at least $10million. Having bashed shale oil, I have to promote shale gas — looks like more and more shale gas companies could make positive cash flow now. Just read that EQT production made $260million positive income in 2017. It is now the largest natural gas producer and a pure Appalachian shale player . So does Range Resources and even CHK also moved into positive cash flow. 1. Land acquisition cost: this might have to be averaged to more than 1 wells for stacked resources in the Permian; most companies claim that they could develop at least 2 stacks. 2. Cost of drilling and completion: probably higher, Pioneer’s 2018 program is $2.6Billion for poppping 250~275wells, and water cost vertical integration etc. is $260million (this water cost is likely to stay and increase each year and not likely to be front loaded as they said 5 years ago). This means currently each well still costs ~ $11million in Midland. I am privy to actual well costs in the Permian and longer laterals and bigger frac’s, with horrendous water costs, are now $8.5-9.5M. What I am not privy too, and nobody can be, I suppose, is water infrastructure costs (in and out) (particularly in the Delaware) that, as Nuassembly suggests, is not “front loaded,” not any more, (the big bottleneck on the horizon is disposal of produced water) and how land, title, geophysical, etc. etc. is ignored in investor presentations, etc. as to well costs. I remain convinced that if we ordered the full meal deal as to what things actually cost in the Permian, the truth, we’d be stunned. $11M per well would not surprise me a bit.